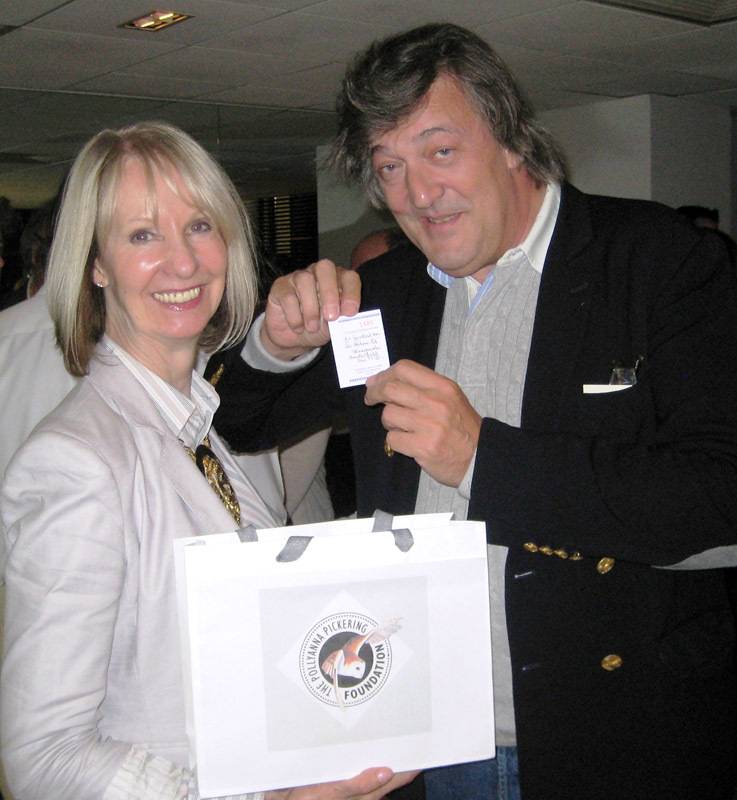 Stephen Fry helps Pollyanna pick a Winner! Stephen Fry, the much-loved comedian, actor and writer joined TWASI patron Pollyanna Pickering to select the winning ticket in her charitable Foundation’s grand prize draw, which raised money to help conserve wild cheetahs in Namibia. The prize draw was held in conjunction with Pollyanna’s recent exhibition of paintings of endangered species ‘Last Chance to Paint…. ?’ – inspired in part by the BBC television series ‘Last Chance to See…..’., a series of documentaries featuring Stephen Fry and zoologist Mark Carwardine travelling to various locations in the hope of encountering species on the brink of extinction. Pollyanna recognised a parallel between her own painting expeditions and the journeys made by the intrepid duo, and the way in which they are then able to share their experiences of the natural world and encounters with some of the world’s most vulnerable creatures – in her case through her award winning artwork. Supporters up and down the country bought tickets in this national draw to help raise £3,250.00 which will be used to fund a cheetah education programme in Namibia. Ninety percent of Namibia’s wild cheetah live on farmlands and come into conflict with farmers and livestock and game farming interests. Funding from the Pollyanna Pickering Foundation will enable The Cheetah Conservation Fund education team to conduct a weeklong training course for 30 farmers. The Foundation believes that education programmes of this kind are one of the most important factors in ensuring the continued survival of cheetahs in the wild, where they belong. Mrs Read of Derbyshire is the lucky winner of Pollyanna’s original painting of two cheetahs.